Expectations were high for Stetson Showcase. Given past success, the 20th anniversary event was touted as both a launching pad for careers and the culmination of undergraduate study. This year, a total of 235 projects – results from more than a year of work by 248 students – were prepared for display to faculty and a panel of judges along with fellow students and the general public. In addition, the event’s theme was “Make Waves,” and the keynote speaker was Stetson physics alumna Sarah Caudill ’06, herself once a Showcase standout and a member of the support team that won the 2017 Nobel Prize in Physics. Sarah Caudill ’06 delivered the keynote address. The final outcomes, viewed across the DeLand campus April 17, did not disappoint, according to Kimberly Reiter, Ph.D., chair of the Stetson Undergraduate Research Committee and associate professor of ancient and medieval history. “Once again, the students demonstrated to their peers, their faculty and the judges that a Stetson education, based in undergraduate research embedded through all four years, is an awesome undertaking,” Reiter said. Former Showcase winner Sonja James-Gaitor ’14 presented the new Dr. Leonard Nance Award for Excellence in Social Justice Research to Samantha Hartman. 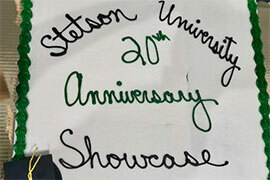 Host sites were indicative of the event’s diverse nature and Stetson’s interdisciplinary academic approach. There were poster presentations at the Rinker Fieldhouse in the Hollis Center, for example, and at the Allen Hall Auditorium, where sociology majors presented adjacent to computer science, biology and English majors, among others. Art and digital arts students presented and exhibited at the Homer and Dolly Hand Art Center. Business majors were well represented in the Lynn Business Center. Music recitals were held at Lee Chapel in Elizabeth Hall. Meanwhile, oral presentations were being made in another part of Elizabeth, along with Sage, Flagler and Presser halls. And so on. “The work put into these [efforts] astounds me, a feeling echoed by judges who every year find their task increasingly difficult in the face of so many excellent projects across the university,” Reiter added. By late in the afternoon, with all presentations and performances nearly completed, a great sense of relief also was evident. For participating students, Stetson Showcase now meant challenge met, feat accomplished and another step toward graduation in May. Nearby, computer science and math double-major Kathryn Sarullo was smiling broadly. She had explored algorithms – taking data and categorizing it. She tested 18 different data sets, with a goal of taking an algorithm and speeding it up. She exhaled deeply. No words were needed. Ashtan Madsen, a psychology major, studied anxiety among college students, which has a prevalence of 47.4 percent, she cited without hesitation. Her research examined the factors of that anxiety to identify leading predictors of positive outcomes. Her chief finding – appropriately enough for Stetson Showcase – was that the amount of time and effort students invested in learning may be more important than social support in reducing their anxiety. Notably, her level of stress, like with the other students in the room, appeared significantly reduced. Winners from each of the locations and poster sessions received a Maris Prize of $200 and a certificate of excellence. In addition, eligible preselected candidates were judged for the new Dr. Leonard Nance Award for Excellence in Social Justice Research, which was presented by Sonja James-Gaitor ’14, a former Stetson Showcase award winner. James-Gaitor created and endowed the award. The School of Business Administration presented a total of $2,400 in student awards. The Scholarship of Business oral presentations were divided into four distinct sessions, with a first- and second-place winner selected from each session.